Rodril wrote: No, limits of GlobalTxt have not been removed, why would you need it? I have not noticed any special functionality of GlobalTxt items, new lines can be stored in NPCText with same effect, or right in scripts, i think. It will be usefull because of special polish characters. Sometimes if text isn't loaded from Str, Global.txt etc. special characters are not showed correctly. Rodril wrote: There is outdated part of script at lines 1252 - 1257, it was supposed to shrink amount of required memory for new dolls by excluding from item-handle mechanics ones that can not use armors at all (like dragons). I have not played with new dolls a lot, can not say if excluding armorless dolls have any sense now. To make it work: comment or remove 1252-1257 lines of code in RemoveItemsLimits.lua (or download one from mm678 files), don't forget to add extra columns to "Complex items pictures.txt" (t4, t5). If I would remove this parts game will return error at start. Last edited by J. M. Sower on Apr 2 2018, 9:09, edited 1 time in total. These lines should be commented, i've done it, redownload script, please, tell if it works. Rodril wrote: These lines should be commented, i've done it, redownload script, please, tell if it works. Have you tried anything besides armors? Boots, helemts? Does these have problems too? Also, have you made image with "v5a" postfix? "a" used for armor variation when character does not have weapon in main hand. Rodril wrote: Have you tried anything besides armors? Boots, helemts? Does these have problems too? Also, have you made image with "v5a" postfix? "a" used for armor variation when character does not have weapon in main hand. Finally! It works with postfix. Thanks! -Ability to change effects of potions (i.e. make "Restore MP" a compound potion instead of a basic one). Have either of these become possible over the last year or so? Hmm... doesn't look like Grayface has been around lately and this got buried. Here's to hoping he sees this. BTB wrote: -Ability to change effects of potions (i.e. make "Restore MP" a compound potion instead of a basic one). You can achieve these with existing "RemoveItemsLimits" script ( https://www.dropbox.com/s/7vp7ouh73ugv3 ... s.lua?dl=0 ), put it into "...Scripts\Structs" folder. Here is video explanation of it's capabilities: https://youtu.be/lipriutf3SI (unfortunately i've run out of space in my dropbox). I don't know how to do it at the moment. Last edited by Rodril on Jun 1 2018, 0:34, edited 1 time in total. Ooh, this is very nice! I can see the relevant snippet in what you posted for potions, but I wouldn't know where to begin editing it. Could you show me an example edit? Seems, file host has not handle the video, i've uploaded it to Youtube: https://youtu.be/lipriutf3SI . I've forgot to mention, this script works only with MM8. Script generates few new tables in "...Data\Tables folder", one of them is "Potion settings.txt", something can be edit there. Also there is new array in game - evt.PotionEffects . It consist of functions, indexed according to "Pot Id" column of TXT file. How it works: when player uses potion (drink it or uses on other item), if evt.PotionEffects have function at index of this potion, function will be executed, if function returns "true" original behaivor of potion is bypassed. Item.Broken = true -- note, first you have to allow potion to be used on items in "Potion settings.txt"
More detailed explanation is in video, i'm sure it is possible to watch it now. (*temporary) = "attempt to call field 'IgnoreProtection' (a boolean value)"
I wonder if there is a possibility to add some soundtrack to the character selection screen. What do you think? 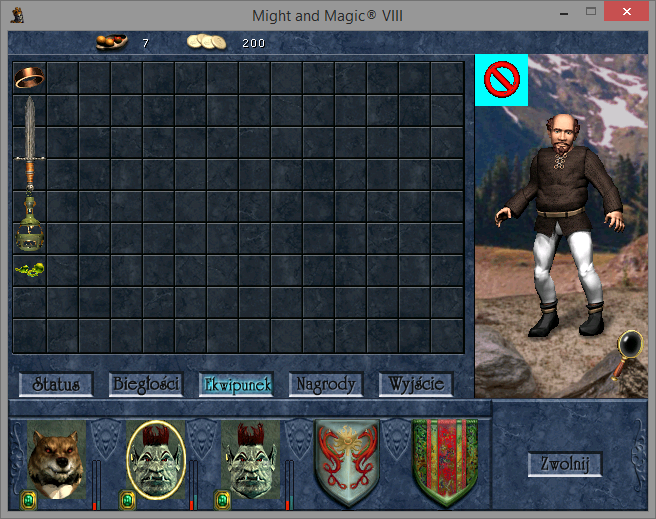 fname = "C:\\GOG Games\\Might and Magic VIII - Day of the Destroyer\\Scripts\\Structs\\After\\LocalizationAndQuests.lua"
err = "...estroyer\\Scripts\\Structs\\After\\LocalizationAndQuests.lua:564: use of unknown global variable \"TakeItemFromParty\" after _KNOWNGLOBALS_F declaration"
fr3aksh0w, the merge includes everything already. Last edited by J. M. Sower on Dec 4 2018, 20:17, edited 2 times in total. What sort of buttons do you want to press? GrayFace wrote: What sort of buttons do you want to press? Mainly exit button from spell book. I have tried some ways but I can't close this window with scripts... I'm trying to add new spells But not "really" new spells, if you would look at the code. They will be good illusion, but made in completly new system. At this time I try to make the "aiming" screen for some spells. I have made spell that changes clicked monster to another one (friendly), but I'm struggling with Game.Paused and unfortunetly Mouse.SetIcon(Icon = "MICON2") is closing my game... Maybe there is some way to run original aiming screen for own purposes, without recreating it? Last edited by J. M. Sower on Dec 6 2018, 11:11, edited 1 time in total. Last edited by J. M. Sower on Dec 6 2018, 11:12, edited 2 times in total. J. M. Sower wrote: Mainly exit button from spell book. if you need to do something after exiting in same function. Also there is function "DoGameAction(Ation, Param1, Param2, Now)", you can emulate other player's actions with it. First three params are same as in "Action" event, if "Now" is true, action will be executed immediately, but it can be glitchy. "DoGameAction(113)" in most cases will work same as "ExitCurrentScreen()".